A megalomaniac has taken over the nation and launched pogroms against its most vulnerable members. Civic faith is at an all-time low, bringing the country to the brink of disunity. Party loyalists have been installed at the head of public schools, and the military is being built up anew for no reason known to the public. Not that anybody seems to care about any of that, except for the girl with no soul and green skin. Welcome to the land of Oz, roughly forty years B.D. (Before Dorothy). This is a world where dragons, dwarves and oracles compete to shape the future of a drinking club for college-age witches. This is a world where daughters abandon their fathers’ religion and neglect to wage revolution in support of equal rights for talking Animals. This is a world where the Good Witch of the North marries into money, and the lion cub that will one day be called Cowardly is sacrificed to science, and only the Scarecrow has enough brains not to let us know what his story is. This is a story about evil and goodness, science and faith, failure and forgiveness. These are the life and times of a woman called Sister Saint, and Auntie, and eventually the Witch of the West, but Elphaba before all that. •	Yes, this book has a musical based off of it. It’s a good musical. Forget it ever happened. Do your level best to approach this book as though you’d never even heard of Kristin Chenoweth. Pick it up the way you would a dusty old novel in some hole-in-the-wall bookshop, one that caught your eye for reasons you don’t fully understand even while you’re prying open the cracked cover. Later on, we can discuss the differences between this book and its spinoff, and wonder how oh how did they ever manage to get from point A to point B, sure the flying monkeys made more sense in the new version and a lot of other things too but where did Kiamo Ko come from, also Nanny didn’t even make it into the script, this is unacceptable, also much Quadling erasure such wow, and other pressing concerns. All in due time. •	It has come to my attention that this book is what some people would characterize as “unfinishable”. Yes, the book is dense. Yes, it’s hard to understand in places. (Try reading a grimoire sometime?) Point is, you will know pretty early on whether or not this novel is for you. If you find you liked it, but don’t know whether to keep going with the series: I can honestly say it gets more accessible (and maybe less depressing) later on. Lots of people liked book two. •	There are a lot of interesting narrative choices in this book, one of which sticks out to me. Normally, when an author realizes they’re trying to cover too much time in too few pages, they downgrade their scope a little. Gregory Maguire just says “eh, you didn’t really need those next seven years; tune in next week to see what she’s like at age thirty”. We can discuss the motive below. (It seems to have been a simple case of “I’m just trying to explain how the Wicked Witch came to be, and it turns out I don’t actually need the other 60% of her life to accomplish that”). I’ve never seen him do this anywhere else, not in this series or any other (though I’ve also never seen him tell a story in chronological order). •	Yes, the Witch of the West is a nun. This author has never met an absurdity he didn’t like. •	The romance scenes. All I’ll say is I’ve never seen any author handle them quite the way this guy does ‘em. o	"You're in trouble, let me in." "You don't?" She smiled, not nicely. "When I do disappear again, dearie, I'll surely be less real than I am now." o	"And there the wicked old Witch stayed for a good long time." "And did she ever come out?" o	Liir disappeared into the sea of humanity in the Emerald City to search for his half-sister, Nor. He was not heard of again for some time. Ok, good advice, tried to get into this once and just did not grab. Well same with one of the original Oz books. Does it deal with the idea that the original was metaphor about the political/social issues of the day, or is that idea spurious commentary? I think the general consensus is that the original Wonderful Wizard of Oz perhaps had some satirical touches, but the whole unified allegorical theory ("and the shoes symbolize free coinage of silver, and the Cowardly Lion is really William Jennings Bryan, and...") doesn't really hold together. This is as good time as any to admit that I never read the original Oz books. I'm only going off of the movie, to engage with this series (which is enough, by the way, for now). I will say that there is a whooooole lot of social commentary in this series (which I tried to make clear in the original post). I honestly couldn't say whether it has anything to do with the original. My guess is, it's Maguire's own thoughts. The most important message of Baum's Wizard of Oz is that the main characters who were citizens had what they needed within themselves. I can honestly say it gets more accessible (and maybe less depressing) later on. I found this to be the opposite. I loved Wicked and it made me think very hard for a very long time. I couldn't get into a single one of the other Maguire books. I read this in high school and found it enormously bleak, almost too much to go on with, but then I too was feeling enormously bleak at the time and I persevered. I was glad I did, but my heart was broken. When I heard that it would be a musical, I was delighted -- I thought it would be incredibly well served by a score like Sweeney Todd's. Then I heard the thing itself, and found it unrecognizable. I still wonder what Sondheim would have done with the real storyline. I liked Son of a Witch, but I couldn't bring myself to read his other Oz novels after reading his Lost, which was just brutal. (I did enjoy Confessions of an Ugly Stepsister, though.) Maguire could out-grimdark GRRM if he was put to it, I think. 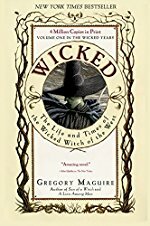 It was within a month or two of reading Wicked that I found a copy of the novel Was by Geoff Ryman in the library. This is an entirely different re-envisioning of Oz as layered ideas, particularly as a tragedy enacted by the life of Judy Garland. I want to throw in a word for it here. I loved Wicked and it made me think very hard for a very long time. I couldn't get into a single one of the other Maguire books. Maguire could out-grimdark GRRM if he was put to it, I think. When I heard that it would be a musical, I was delighted... Then I heard the thing itself, and found it unrecognizable. Yeah, they took a lot of liberties. To be fair, the source material wasn't exactly stageable as it was, and they sort of preserved the original message, but wow was it a completely different animal. Can't stress this enough, people: do not go into one expecting more of the other; they are nothing alike; you will be disappointed. and the first trans character in children's lit. Your mission: reread Son of a Witch, paying attention for the giveaway, then finish the friggin series. You may discuss that particular character all you like, but for the moment, my lips are sealed. Never heard of Was. Thank you for pointing it out.